Judith, in her usual thorough way, introduces much scientific thinking, both pro and anti. It is a point I have often made. There is little dispute, outside of the blinkered Hockey Stick community, that the world’s climate has regularly swung from warm to cold and back again. The most recent episode, of course, was the plunge from the MWP to LIA. Yet nobody, in my opinion, has come up with any plausible theory to explain these cycles. Until we can explain why the world’s climate changed from Middle Age warmth to the coldest times since the Ice Age culminating in the 19thC, we cannot hope to understand why it has warmed up again since. 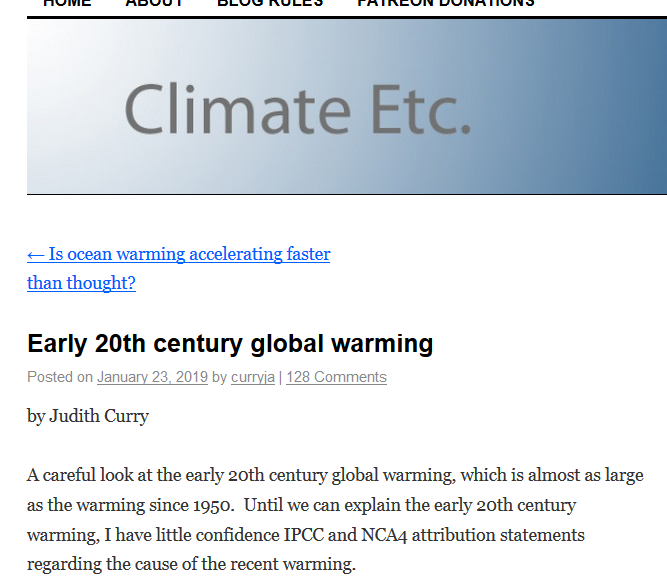 As Judith notes, it seems that the oceans have a big role to play in this, and this is something else today’s CO2 obsessed scientists have little understanding of. We hear that the oceans have warmed up as a result of AGW. But as anybody with basic knowledge of oceanography will tell you, it is ocean temperatures which dictate the world’s climate, and not vice versa. And until we can fully explain what drives oceanic changes, we cannot hope to predict what might happen in the future. Yes well we’ve spent probably billions on so called climate ‘research’ over the past two decades and we know essentially f….-all because we’ve given it to cretins. Judith stands out. She has been abused and not received the funding she and others with similar insight deserve because the funding bodies are to all intents corrupt. The ‘college’ approach to funding as practised in the UK by NERC is a collection of self-congratulating, self-serving onanists who do not serve science but feed their own projects and egos. It is our money they spend. I have no idea why it is allowed to continue without outcry. Good point Paul. Mankind probably knows more about the moon than what goes on in our oceans which, after all, comprises approx 70% of the surface of the globe. Bearing in mind ‘urbanisation’ covers little more than 2% of the planet and man’s contribution to the entire earth’s output of so called green house gasses is a trifle at about 5% in comparison to the naturally generated 95%, why, in God’s name, do the so called experts believe that mankind doing anything whatsoever will change the climate? Mankind could bin all fossil fuels for a generation and Mother Nature will just shrug her shoulders, laugh and say ‘guess what guys you’re getting this’! It may be colder, it may be hotter, but there’s bugger all we can do about it. The biosphere is always subject to lags in response on many timescales. Midday is not generally the hottest time of the day. Late June is not the hottest time of the year (all other things being equal in both cases). The alarmist response is also subject to lag. It is 5 to 10 years on average. Whether it is global temps, sea ice area, polar bears or any other metric. First comes denial (sorry), the temp pause is not happening or sea ice is still disappearing etc. Then a slow admission follows (except for those who simply can’t believe the truth), soon followed by the rash of amazing excuses. I still believe that some deep believers will have mental health problems when the penny does drop. I thought this failed predictions list over at Ice Age Now is worth a bookmark – originally from No Tricks Zone. We could do with a UK based one as well. I see that at the given NoTricks link there are many more quotes, including a few from the UK. That was in 2013, must be many more by now? What drives oceanic changes? The Sun and Earths reception of its energy. What varies the reception of the Sun’s Energy? The suns varying output as modulated (amongst other factors) by gravity from the planets (the sun is pulled by the gravity of the planets and when Jupiter and saturn are aligned the centre of mass of the solar system is pulled outside of the sun!) making the Sun lopsided. Magically Jupiter and saturn work on roughly 30 and 60yr orbit cycles. Also cosmic ray reception on earth governs cloud formation. More cosmic rays equal more low cloud equals cooling. Many factors govern these cosmic ray impacts that perpetually bombard the Earth. The answers to changes on this planet are outside this planet. Our varying orbit, our varying sun, our moving solar system partners, our moon – it can lift oceans several meters (the tides are a visible clue to a huge force acting on the Earth) and routinely moves that vast mass of water across the equator. Until we understand (and we are only starting to investigate) how these huge forces are acting on our planet all else is trivia. The role of sub-sea volcanism and hydrothermal vents in ocean warming is not well understood either. Beneath the oceans a global system of mid-ocean ridges produces an estimated 75% of the annual output of magma. An interesting point from Principia Scientifica is that water is semi-transparent and the depth of absorption depends on wave length. Thus sunlight will warm the oceans and lakes to significant depth. Plankton and algae absorb sunlight to grow and obviously change the depth of absorption. (the dirtier the water the more the surface will absorb) Thus there could be an important biological feedback mechanism on the depth at which the sunlight is absorbed which could affect ocean circulation. Such growth is known to be dependent on trace nutrients such as iron which are transported as dust by winds from deserts such as the Sahara. One more general point is that since the Earth has had a fairly stable temperature for a very long time there must be negative feedback mechanisms to control it. It seems these are likely to be biological mechanisms as most physical mechanisms used in the modelling efforts seem to have positive feedback which leads to all the exponential growth predictions which have proven to be false. Essentially the Gaia hypothesis. These mechanisms will probably act on different time scales leading to oscillations on multiple time scales. This seems a bit odd, or oddly stated. In clear water the short-wave radiation will travel to a depth, lets say 100 m.
During that passage there will be progressive absorption. This warms the water column. Dirty water may cause the column where uptake happens to decrease in length, say to 30 m.
That would be nearer to the surface, but not at the surface. Seems the amount of energy transferred to the water will be the same. The red wavelengh is absorbed within the first few centimeteres of sea water whilst greens can make it down to about 800 to 1000m. In temperate waters you see a thermocline, in summer you see the seasonal thermocline. In the past I have used LIDAR to map the sea bed, turbid water effects the range of LIDAR considerably. Yet Tamino (https://tamino.wordpress.com/2019/01/23/hot-and-cold-curry/) has a scathing critique on Curry’s paper. So who is right? I don’t have the skill to evaluate – can someone help? Why don’t you search for statements about Foster and see what you find and whether or not he always seems fair & reasonable. Also, wait a few days and some of those who know the material well will post about the “scathing critique” you mention. Tamino is a blinkered, no nothing fool. He is a 100% believer in the alarmist view and will not even begin to consider anything that deviates from it. Curry on the other hand is open to new evidence and is the sort of scientist that all scientists should be. I know which one I would be inclined to believe. Early 20th century warming is very well documented, not just in temperature data. We are told that current climate is unprecedented, when there is a vast store of anthropological, archaeological and geological data saying otherwise. In actual fact, the climate we are living through is more benign than in many other millennia, but every weather event is now “evidence” of climate change. They can’t even agree which industrial revolution to use, 18th century or 19th. Hansen used to use 1760, now they seem to use 1850. The Little Ice Age was a fact and it was global, lots of evidence showing that it was. Has it warmed by 1 degree since before the Industrial Revolution, whichever one? I sincerely hope so. Why would we be happy with temperatures that caused such widespread crop failure, starvation and death across Europe. What is the correct temperature for the planet anyway, how do you measure it and who gets to decide? CO2 is not a control knob. Quite right, it is the sun that warms the oceans, not the atmosphere, and certainly not a trace gas. Cloud cover dictates how much of the sun’s energy enters the oceans, so we need to understand much more about clouds. And we mustn’t forget volcanic energy entering the oceans, again something we don’t know enough about. On clouds – one blogger (Chiefio) recalls than when he was working for Cray computers, they had a policy of allowing some free time for post-grad students to run SERIOUS programs. One of the grants was for a meteorologist to try to simulate clouds and their formation. Apparently, at the time (some 20-odd years ago) there wasn’t enough computing time available (on a Cray!) to even START to do the simulation. Clouds, with their formation and effects are one SERIOUS problem that I don’t think that any of the GCMs approach. And then, what if the cloud effect is one of the major contributors to ‘climate’? Before trusting any of the projections from climate models, it’s well worth reading this piece from Willis at WUWT.